This vintage-inspired necklace features a lovely oval locket with a detailed floral design, accented by a pale blue flower with an ivory pearl at its centre. 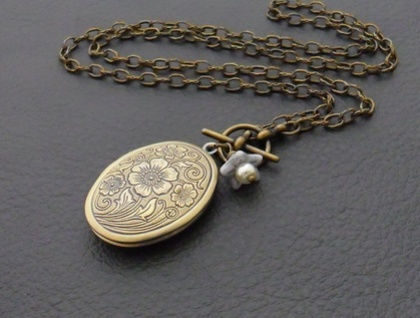 The high quality locket is made of antiqued-brass coloured metal, and is decorated by an ornate, old-fashioned design of flowers, leaves, and scrolling tendrils. It opens and closes beautifully – it won't slip open by itself, but neither will you ruin your fingernails trying to open it! It sits flat when fully opened, and inside it are two oval spaces for two images or photographs, measuring 23mm by 16mm. You could also add a tiny piece of fabric or ribbon, a lock of hair, a note, or some other small thing. I recommend adhering your treasure to the inside of the locket, or stuffing it in securely, to be certain that it won't come loose and work its way out. The back of the locket is smooth and plain. 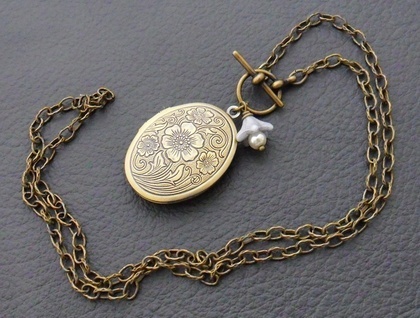 The locket is accented by a small glass flower in periwinkle blue, with a centre made of an ivory coloured glass pearl. 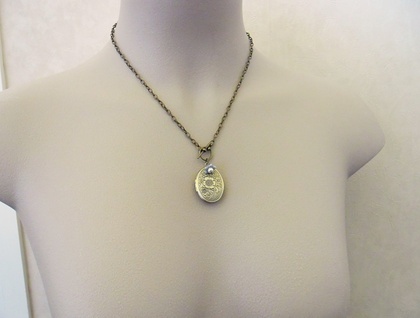 The chain is antiqued-brass in colour, with textured, oval links. The necklace fastens at the front, above the locket, by means of an antiqued-copper coloured toggle clasp. Front-fastening necklaces are convenient if you have difficulty reaching behind your neck. The 'Flora' necklace measures 49cm, including both parts of the toggle clasp. 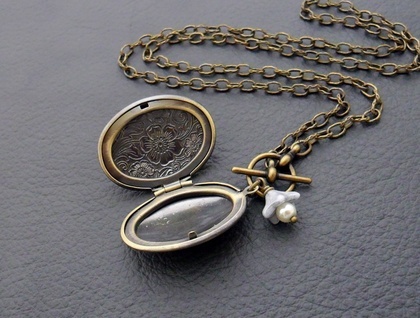 The locket measures 29mm lengthwise, not including the baile (the little hanging loop at the top), and 24mm across. The wee flower drop is 14mm long, including the wire-wrapping at its top. If you would like a different length of chain, just leave a message in the ‘notes to Silverlight’ field that will appear when you check out of Felt, stating what you would like. Such alterations can be made at no charge.